Resembling a child’s toy more than a piece of furniture, the whimsical form of the Spun Chair, designed by Thomas Heatherwick and his team, Heatherwick Studio, came about in answer to the question, ‘Can a rotationally symmetrical form make a comfortable chair?’ Heatherwick and his colleagues were initially inspired by the traditional manufacturing process of metal spinning, in which flat sheets of metal are spun and shaped against a form to make things like kettles and drums. After many weeks of experimenting with forms and making models and maquettes, the team worked with the London-based gallery Haunch of Venison to produce the first versions of the Spun Chair, which were made from smooth polished sheets of different metals. In 2010, Heatherwick Studio collaborated with the Italian furniture firm Magis, to mass-produce this plastic version of the chair with a different kind of rotational process, rotation molding. Plastic pellets are placed in a heated metal mold that is rotated until the inner surface is evenly coated with the melted substance. After cooling, the finished chair is released from the mold. Spun’s ridged surface reinforces the rotational shape, bringing to mind the grooves in hand-thrown clay pots or vinyl records. Durable enough to be used outdoors or in, this colorful plastic version of Spun makes for a creative and entertaining take on the act of sitting. The form invites the sitter to move and spin, have fun—sitting is no longer passive. Even lounging in the bowl-shaped seat means shifting and experimenting until you find your point of balance and a smile in the process. The bronzed brass Spun Coriolis chair from the limited edition metal series is currently on display in Provocations: The Architecture and Design of Heatherwick Studio, on view at Cooper Hewitt, Smithsonian Design Museum, June 24, 2015-January 3, 2016. Visitors are also welcome to take a spin in several polyethylene Spun Chairs in the museum’s Ground Floor Gallery. 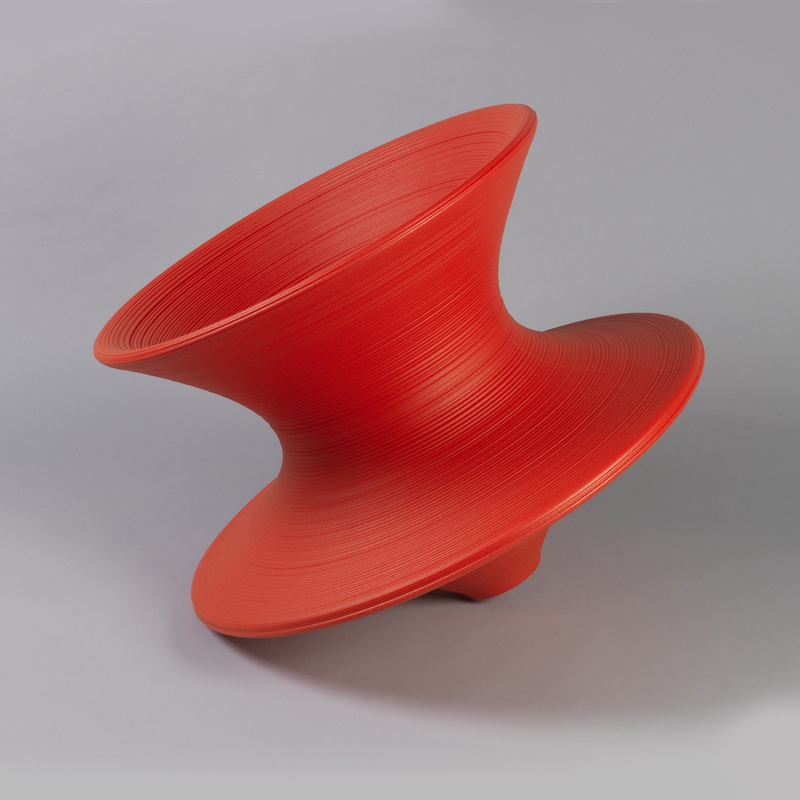 The museum’s bright red Spun Chair is currently on view in Cooper Hewitt’s reopening exhibition, Making Design.